Balcony is a place where it is either made of wood or tiles projecting from a wall. It is a place where people usually dry the washed clothes or for planting some plants. In case if you live in an apartment the balcony is either with a small or large spaces and is decorated with the flowering plants. Few people even place chairs, chaises for sitting in balcony and enjoys the natural environment. If you have a large place you can design it with wood where children can play and can be even used for reading books. A balcony can include couches, chairs, swing, garden with few flowering or ornamental plants and is enclosed either with the wooden sticks or iron work as a fencing. If you stay in a apartment in the top floor you can view the entire area where you live in from the balcony. It is a space which makes you to feel pleasant and foxy. Here are few images to have an idea about the balcony ideas whether the space may be small or big and you can choose these designs which looks classy and impressive. In the view of this image you can see the alluring natural environment. It is a design of balcony in an apartment or an independent house. The balcony is decorated with a chaises made of wood for relaxing or you even have a small nap in the evenings. 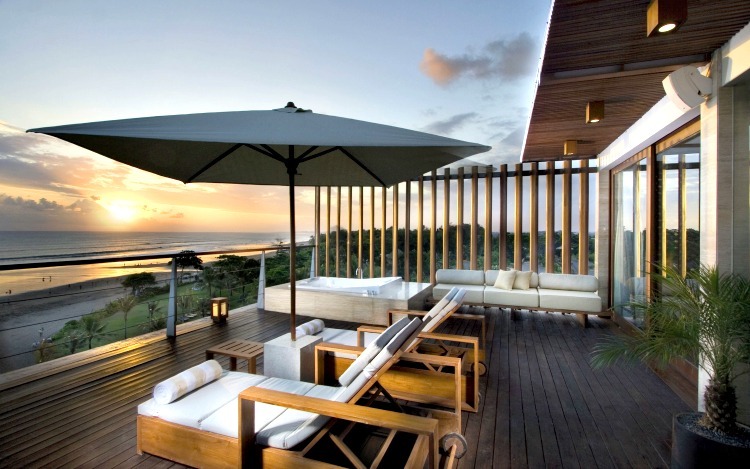 The chaises are covered with the Andaman cantilever umbrella so that you can even enjoy on a sunny day. The flooring is made with the deck wood and has wooden and iron fencing around the balcony for safety measures. There is even a lawson modern couch for sitting and has a pine plant. This image shows you a amazing sunset and looks phenomenal. 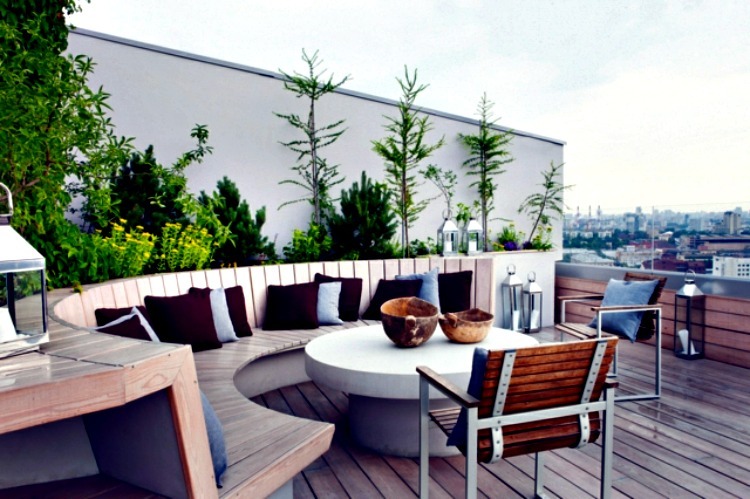 The balcony space is small and is placed with the knitted couches which has earthy color, comfy with the pillows. It is a seaside balcony where you can see the beauty of the seashore and can view the sunrise, sunset and the colorful environment. In the morning if you usually come out to the balcony you can enjoy the birds chirping, snow, breezing winds and the beauties of the nature which are unlimited. Here the flooring is made with the ceramic tiles and is decorated with few gardening plants. 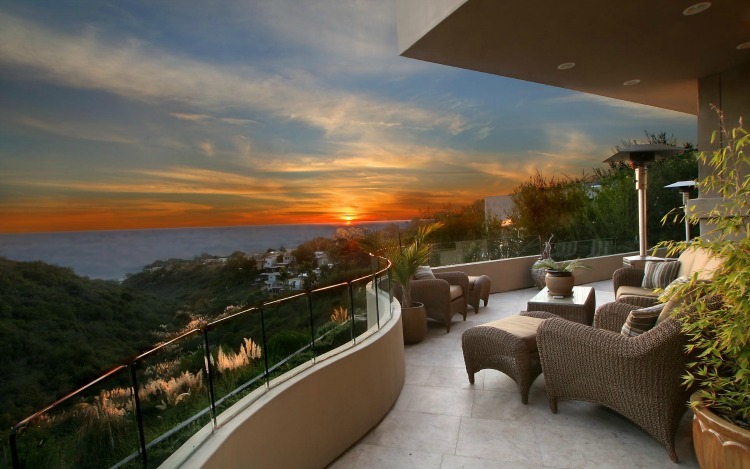 This image has an outdoor view of the entire area from a balcony which is on the seaside. 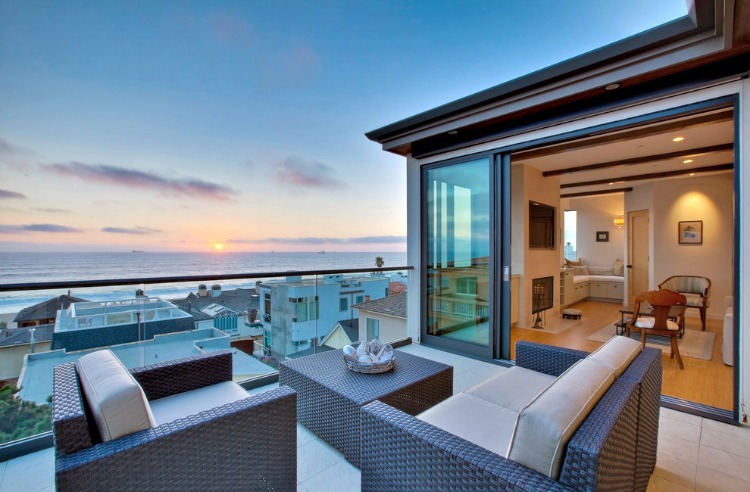 The design of balcony looks modern and elegant. The flooring is plain and is made with the plain vinyl flooring. Here in the design the balcony has two chaises for sitting and even the dining is arranged with four seaters where you can have food or casual drinks. The fencing is made with glass and iron which looks sophisticated. Here you can have a outdoor view by sitting in the balcony and can enjoy the natural environment. If you want you can even decorate it with gardening plants. In the view of this image you can observe a traditional design of balcony. This balcony is decorated with the plants such as Alacasia calidora elephant ear of different colors which adds color to the balcony and makes a feel of calming environment. The balcony is made with white deck flooring and has a stripe textured carpet. There are beije soft sofa and two comfy stools with a centre table used for decoration with plants or to serve with food items. The balcony is fenced with iron and has an paraflex umbrella for shade. This is one of the beautiful design of a balcony which is simple and is inexpensive. The flooring is made with the wooden deck and the fencing is laid with iron which gives classy look. The balcony has Wrought iron furniture with a coffee table made of glass and iron to sit and two chaises for relaxation. This balcony also gives a view of entire city which is amazing. It has decorated with box wood in pots, which is a gardening and an evergreen shrub. It is a small tree usually used for gardening who likes a modern look. In this image you can see a large seating arrangement which is made of wood with saturated color pillows. Here the balcony has a round coffee table which is decorated with the organic hand made ceramic bowls. If u have a lot of space in the balcony you can choose this design which is inexpensive. The advantage of this design there is no need of placing chairs or couches because with wood a round sectional sofa is designed. The balcony has some wall lamps as it can be used when it is dark and is decorated with the flowering and non flowering plants. Here the flooring is made with the deck wood and has a bench. 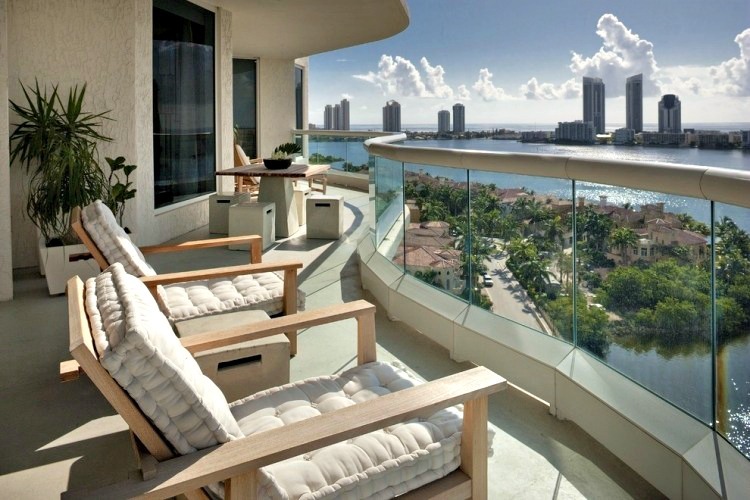 In the view of this image you just get interested in designing your balcony as this image is fantastic. The balcony is floored with the ceramic tiles. It has couches which are woven from the willow branches and has comfy cushions which is eye catching in the balcony and has a centre table decorated with the metal hammered bowl for a dramatic effect. The fencing is made with the glass and the outdoor view from the balcony is mellifluous. Here the living room also has picture windows so that we can have an outdoor view from house, but to have a fresh air you can have a seating in the balcony. This is an image of balcony design for a independent house. The balcony is floored with deck wood and some place is filled with pea gravel. It has decorated with lots of gardening plants which looks greens. It has a chaise for relaxing and you can place some more chaises if you need. The fencing is made with the glass which gives an elegant look and the balcony has a wooden roof top for shade. Even the outdoor garden has many plants and trees. If you have a large space you can go with this design. 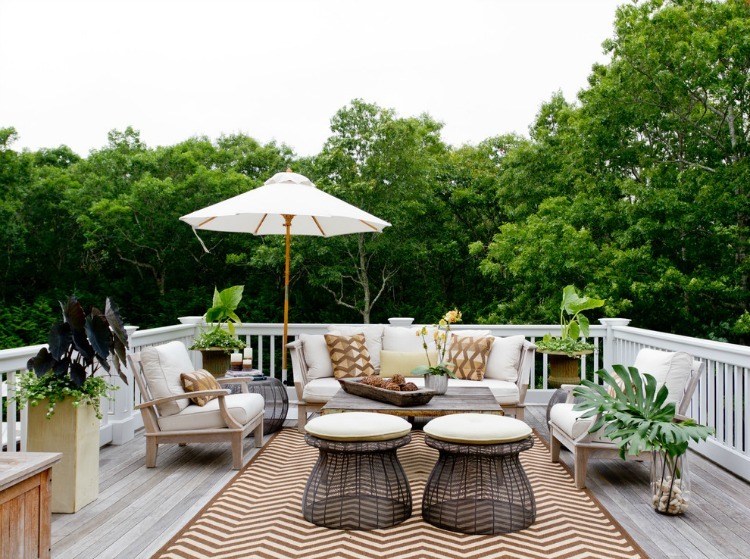 This image of balcony is simple with a dining area of wicker chairs. There is no necessity of placing a dining, you can even place a couch or a chaise for seating and can even decorate it with the gardening plants. The balcony has a fencing of concrete and iron and has a roof top with ceiling lights. The chairs have a bright blue pillows and the dining is rectangular made with the hardwood. The flooring is made with waterproof tiles. The image has a exquisite view of the city. This design of balcony is well suited for an apartment. It has couches which can be folded and can be used for refreshment. The long trees which surrounds the balcony gives a fresh air and makes you to feel pleasant. The fencing is made with the wood and even the flooring of deck wood which is usually used for a balcony flooring. If you like gardening plant some decorative shrubs or bushes in the balcony.